At the presentation of the $10,000 grant are, from left, JFCS executive director Michelle Napell, Amy Solomon from the Church & Dwight Employee Giving Fund, and JFCS board president Audrey Wisotsky. 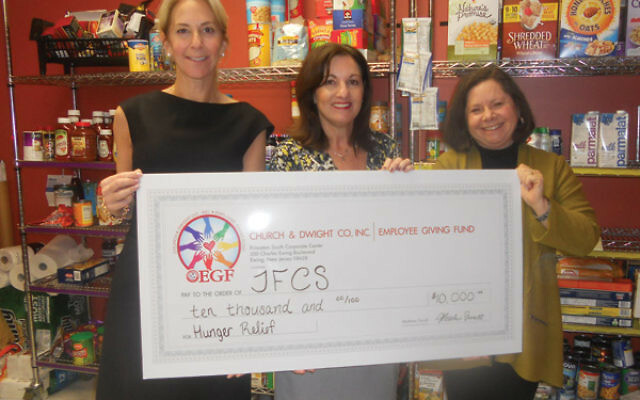 JEWISH FAMILY & Children’s Service of Greater Mercer County has announced that it has been awarded a $10,000 grant from the Employee Giving Fund of Church & Dwight, Inc., which will ensure that the economically disadvantaged families who use the JFCS food pantry have access to healthy foods on a regular basis. 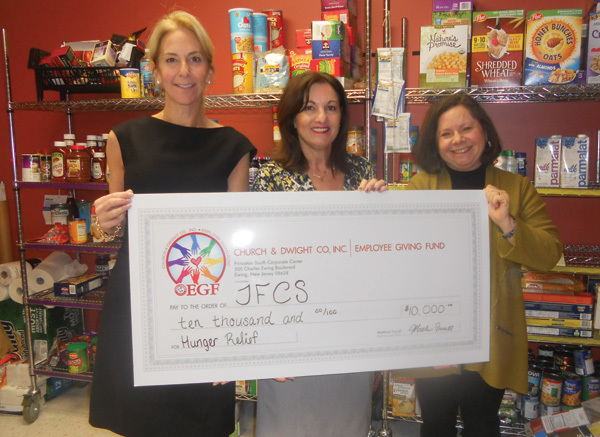 In addition, the grant has made it possible for JFCS to continue to offer hunger education and advocacy programs to community members regarding food insecurity and resources to address this issue. JFCS will also engage community and corporate volunteers to participate in “shop and stock” activities to stock the pantry with healthy foods. “By offsetting some of our families’ out-of-pocket costs for food from their limited household budgets, we are able to help them extend their budgets further,” said Lara Wellerstein, JFCS director of community programs and services. JFCS executive director Michelle Napell said the agency is extremely grateful to partner with the fund to bring “a level of stability into the lives of our low-income clients” and help JFCS meet its goal of providing a healthy food pantry for the community.